LCA Poetry Evening with Poet Joe Williams. Joe Williams is a former starving musician who transformed into a starving writer and poet in 2015, entirely by mistake. He lives in Leeds and appears regularly at events in Yorkshire and beyond. He has been published in numerous anthologies, and in magazines online and in print. His debut poetry pamphlet, ‘Killing the Piano’, was published by Half Moon Books in 2017, followed by the verse novella ‘An Otley Run’ in 2018. 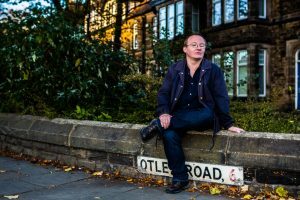 He won the prestigious Open Mic Competition at Ilkley Literature Festival in 2017 and was runner-up the following year. this evening Joe will be reading from his latest publiction ‘An Otley Run’. Open mic in the second half of the evening. Entrance £3.50/£3.00 members of LCA and concessions.